The U.S. dollar seems to be finding relief from selling pressure, while the Euro has drifted lower (even if it is just temporary). Yet, risk assets such as the S&P 500 and crude oil have managed to avoid liquidation. Under more normal circumstances, at least based on the last 180 trading days, a stronger dollar could have worked against equities and commodities. For example, the Euro and the ES moves in the same direction about 80% of the time. In our view speculators in one market, or the other, will soon be proven wrong...the relationship between currencies and equities will probably come back into line at some point soon. The fact that the U.S. government is buying back less of its own Treasury securities as as means of slowly eliminating the stimulus program known as Quantitative Easing, is luring Treasury bears out of the woodwork. Nonetheless, one thing we've learned over the years is that the markets aren't always what they seem; more so, there is little room for logic. Sometimes "buy the rumor sell the fact" phenomenons work in the opposite manner (sell the rumor, buy the fact). All in all, the Treasury market has been relatively quiet since the collapse last summer. It feels to us as if speculators are far too comfortable, more importantly the shorts have little fear of being wrong. This is the perfect environment for a volatility shake out. 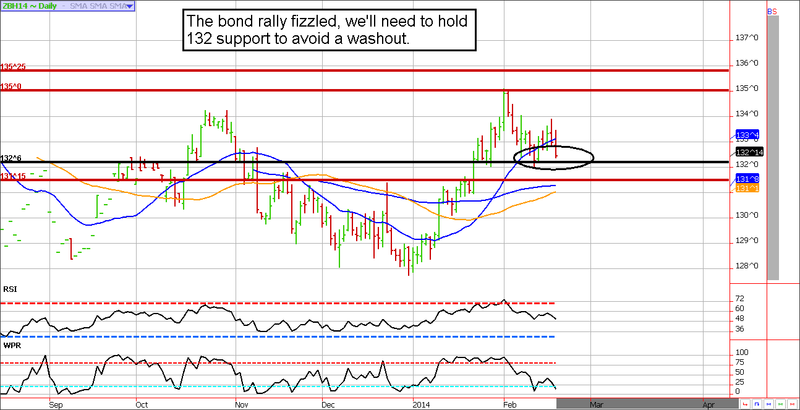 Don't be complacent, we could be in store for a wild ride in the coming months...and we believe it is most likely to result in a bond rally (the opposite of what most are expecting). We continue to see aggressive bearish positions put into place in the 10-year note by small speculators (courtesy of the COT Report). This leaves the door wide open for another short squeeze. All it will take is a little volatility in equities, or maybe media hype surrounding protest in Ukraine, for panic to start to creep into the markets. **Consensus:** The bulls must hold 132 in the ZB to avoid a flush liquidation, but if it happens it could be a late Christmas gift for the bulls. After a sloppy overnight session, stocks were set to soar into option expiration. The combination of high frequency trades (the computers), short call traders scrambling to cover their risk and positions ahead of option expiration, and, of course, the late-comer bears being squeezed out of short positions, dominated trade with little regard to the day's news (which was more bearish than bullish). It isn't uncommon for option expiration activities to pin a market higher, and that is exactly what we think today's rally was all about. We suspect that there will be quite a few short call traders willing to take delivery of short futures contracts from their strike prices; if we are right about this, the current rally should have enough steam to see the 1860 area we've been looking for. This is because those that take delivery will be fickle in their willingness to hold positions beyond early next week. If equities don't see selling pressure on Monday, look for a short squeeze. Position traders will likely be best off waiting for better prices to get bearish than being bullish near record highs. 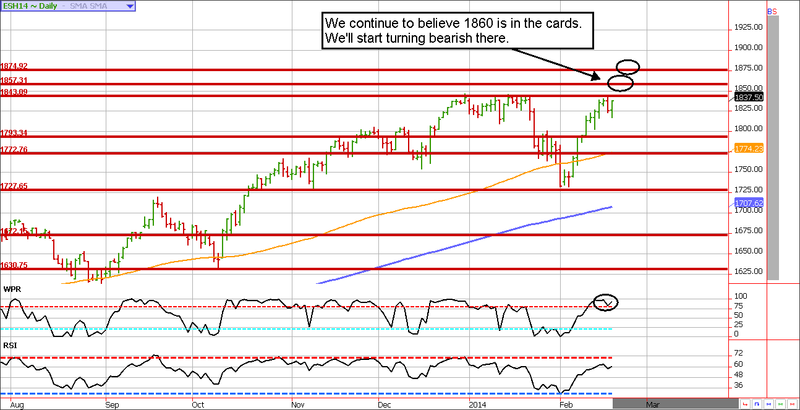 **Consensus:** Only a move over 1860 would pique our interest in selling call options to establish a bearish position. January 14 - Go long wheat futures near 5.75 (minis are preferable for most). January 22 - Sell April crude oil 89/103 strangles for about $1.00 ($1,000). February 10 - Buy back April crude oil 89 puts to lock in anywhere from $330 to $400 in profits per contract before transaction costs. February 11 - Sell April crude oil 93 puts near 45 cents to re-strangle the market and hedge the existing short call left over from the previous strangle. February 14 - Sell mini wheat futures to lock in gain of $270 to $300 per contract before transaction costs. February 18 - Buy back existing strangle (103/93) near break-even overall, and re-sell 105/97 strangles to give the market more breathing room.